In addition to the CMAA's forthcoming Colloquium in Pittsburgh (register now!) and the Annual Gregorian Chant Conference in Florida later this month, here is some information about two other Sacred Music Workshops shortly to take place in the USA. 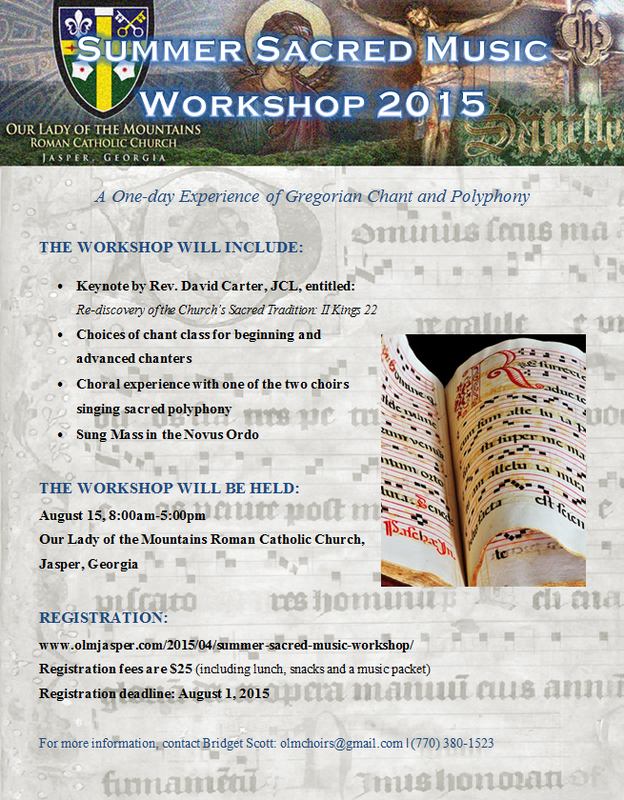 Saint Vincent Archabbey and College in Latrobe, PA will offer Gregorian Chant Workshops on June 15-19 and June 22-26. The first week is an Introduction to Historical Performance Practice of Gregorian Chant, and the second is an introduction to Gregorian Semiology and the new Science of Gregorian Modality. The Workshops, which have been offered every summer since 2011, are taught by Fr. Stephen Concordia, O.S.B., a member of the Saint Vincent College music faculty. Fr. Stephen studied chant with Nino Albarosa and Alberto Turco at the Pontifical Institute of Sacred Music, Rome. For more information and to download the brochure, click here or contact Fr. Stephen here. A Summer Sacred Music Workshop will be held on Saturday, August 15 at Our Lady of the Mountains Roman Catholic Church in Jasper, Georgia. The faculty will include Rev. David Carter, Rev. Charles Byrd, Andrew Leung and Bridget Scott. Details are on the poster below, and more information is available here.